The rugged vintage interior style is a very popular modern style, making use of old-fashioned design elements to create a modern interior design style. When you consider vintage furniture you do not have to only think of stuffy, musty old chairs that have been in some attic for years. Modern furniture design has provided plenty of new furniture with a vintage look. You can think, for example, of elements from the early 1900s until the 1980s, with colours like petrol blue, olive green, matte yellow, and rustic grey. The balance between vintage and modern items must be well kept in your interior. Think of modern chairs around a second-hand table, or a stylish modern floor lamp next to a vintage armchair. Usage of old leather or wooden furniture can also emphasize the vintage look of the interior. One of the most recognisable colours in the vintage style is the colour petroleum blue. This colour offers the interior an authentic look immediately. Nice and retro, striking and yet not old-fashioned but hip! Petroleum blue is also easily combined with other striking colours, but also matches well with calmer colours. Yellow is also often used in retro styles, and is easy to combine with wood, petrol blue, and is eye-catching on its own. 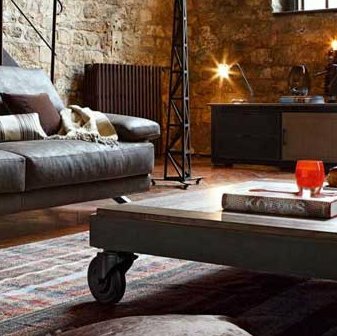 Our favourite combination: old furniture & industrial style. From old factory lamps, to robust industrial furniture and beautiful accessories: we love it! If you go looking for these pearls, we recommend you look especially for authentic industrial second-hand furniture. In the modern day there are plenty of web shops and stores that have a large assortment of apothecary cabinets, lockers, old work benches, ornamental jugs, old station clocks, and more. Have you found a second-hand prize, but the upholstering or colour is not exactly what you were looking for? Then upholster your furniture again! In upholstery the vintage trend is very popular, and many fabric manufacturers have embraced it. They make frequent use of geometric, graphic and velour materials with modern shapes and design. This allows you to really personalise your furniture in a unique way. Super cool!